The LADS organises the Regional Conference of Dermatology (Asian-Australasian) once every two years in rotation among the founder member nations. In 1986, the founder members of LADS formally signed a document at the 6th RCD (Asian-Australasian) called the Bali Declaration formally reaffirming their commitment and common interest in the development of dermatology in the region. The Council of the LADS is composed of current principal office bearers of the national societies. Council meetings are attended by the President and Honorary secretary of the member societies. The Council of the LADS meets once every two years at the Business Meeting of the RCD and shall be chaired by the Organizing Chairman of the RCD of that year. Malaysia was elected as the permanent secretariat for the LADS at the 9th RCD (Asian-Australasian) in Kuala Lumpur in the year 1990. The Dermatological Society of Malaysia shall be responsible to provide the secretarial services and the nomination of the Secretary-General of the LADS. The LADS Council Meeting reviews the progress of the development of dermatology amongst its members and in the region. The venue of the succeeding RCD (Asian-Australasian) is also to formally determine at the Council Meeting. The Council Meeting also appoints Specialty Boards to look into the development of individual Subspecialty groups. 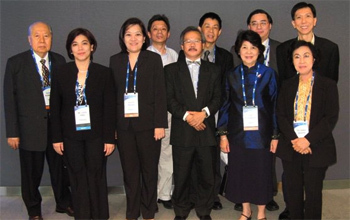 At the Council Meeting, 17th RCD (Asian-Australasian) 2006 in Bali, the Council formalised the formation of the LADS Board of Cosmetic Dermatology and Cosmetic Science. Members of this Board shall hold office till the next Council Meeting. Malaysia was elected as the permanent secretariat for the LADS at the 9th RCD (Asian-Australasian) in Kuala Lumpur in the year 1990. The Dermatological Society of Malaysia shall be responsible to provide the secretarial services and the nomination of the Secretary-General of the LADS.